The Sri Lanka Navy rescued the seriously ill Captain of a Maldivian merchant ship on April 09 around Little Basses Reef, about 500 kilometers South-East Sri Lanka. Navy Spokesman Captain Athula Senarath told the Daily News that in response to the Maldivian request, Sri Lanka Naval Ship Shakthi was immediately dispatched and the Captain was transferred safely ashore at the Galle Harbour under treatment and supervision of a Naval medical team. Maldivian Captain Mohomad Naeem of the Lilly Line merchant ship being handed over to the Sri Lanka Naval Dvora in the mid sea from the Sri Lanka Naval Ship Shakthi. The Shakthi went to the merchant vessel Lily Line took-over the patient, Maldivian Captain Mohomad Naeem and on its way to shore he was handed over to a high speed naval vessel (dvora) to bring him ashore quickly. Thereafter he was handed over to the local shipping agent and was admitted to a Hospitals in Sri Lanka. The merchant ship Lilly Line, a container carrier sailing under the Maldivian flag was sailing from Male to the Port Kelang in Malaysia.The seriously ill Captain was in need of proper medical care and the Shore Medical Advisor had instructed him to undergo urgent medical treatment at his earliest at the medical facility available closest to the ship. 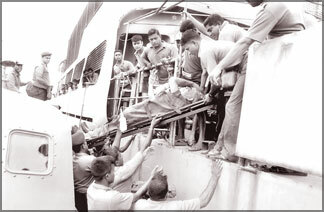 Under the circumstances the Maldivian Coast Guard Headquarters made a request from the Sri Lanka Navy Headquarters, Colombo, for assistance to rescue the Captain ailing on board MV “Lilly Line.”As per the conventions of the International Maritime Organization (IMO) and the International Hydrographic Organization (IHO), Sri Lanka Navy has been given the responsibility to carry out search and rescue operations in a vast sea area around the country which is 27 times its land mass. The Sri Lanka Navy frequently assists merchant and fishing vessels which undergo distress while operating in this area.